Astronomers' "yardstick" for measuring vast distances across the cosmos grew longer today as scientists at The Johns Hopkins University announced they had identified and closely analyzed two distant new instances of a kind of exploding star known as a Type Ia supernova. The new supernovae belong to a group of star types known as "standard candles" that astronomers prize for their usefulness in gauging cosmic distances. They are approximately 4.7 and 7.6 billion light years from Earth, and are found in the constellation Ursa Major, which contains the Big Dipper. According to Johns Hopkins astronomers, the supernovae they discovered will be just the first of many to be identified with a new camera in the orbiting Hubble Space Telescope, the Advanced Camera for Surveys (ACS). That prospect has them excited about filling a prominent hole in their knowledge of the history of the universe. 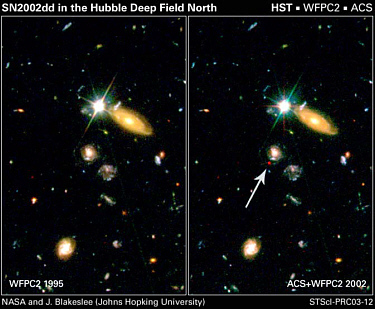 Astronomers used the Hubble Space Telescope to locate a distant supernova (highlighted by arrow in right image). "We're trying to fill in a blank region where the universe's rate of expansion switched from decelerating due to gravity to accelerating growth driven by dark energy," explains John Blakeslee, an associate ACS research scientist at Johns Hopkins and lead author of a new paper due out in the June Astrophysical Journal. "That's a real challenge, but the ACS is making it very straightforward to find distant supernovae and get detailed information about them." Blakeslee and coauthor Holland Ford, professor of physics and astronomy at Johns Hopkins, noted that astronomers have previously identified more distant supernovae, but do not have the same level of detailed information on those supernovae. "We have enough data on the new supernovae to constrain both their distance and the amount of dust obscuration," Blakeslee said. Dust obscuration is important to distance measurements because astronomer's system of "standard candles" contrasts the inherent brightness of a star or nova with its apparent brightness from Earth. "If you measure the brightness of a candle, and then move the candle away from you and measure its brightness again, the candle will appear four times fainter every time the distance is doubled," explains Ford. Astronomers use their detailed models of star formation, development, and death to predict how bright certain stars should be at various points in their life cycle, and then compare that with their apparent brightness to get a better feel for how far away the stars are. The first such "standard candle," identified early in the 20th century, was a type of star known as a Cepheid variable. Astronomers linked the amount of time it took for a Cepheid to go through its cycle of varying brightness to its actual brightness. Type Ia supernovae are white dwarf stars that have been drawing mass from a companion star. The white dwarf siphons off mass until it reaches a critical mass known as the Chandrasekahr limit. "Hitting this limit causes a deflagration that consumes the star in about five seconds," Ford says. "A thermonuclear burning wave, burning oxygen and carbon and higher elements, goes through the star." As a result, the star explodes and shines as brightly as several billion stars for several days, enabling astronomers to see it across huge gulfs. Blakeslee estimated that light from the most distant supernovae he and Ford detected with ACS had been traveling towards Earth since the universe was less than half its current age of 13 billion years old. Astronomers Zlatan Tsvetanov of Johns Hopkins and Dan Magee of the University of California-Santa Cruz compared earlier Hubble images of the same patch of sky with new ACS images to initially identify the supernovae. Blakeslee led the follow-up observations with ACS and other Hubble instruments and the analysis that enabled them to get a detailed fix on the new supernovae's intensity and their distance from Earth. Information from studies of Type Ia supernovae confronted astronomers about five years ago with the stunning, unexpected revelation that stars and galaxies appeared to be moving away from each other at an ever- increasing rate in Earth's cosmological neighborhood. They've attributed this accelerating expansion to a mysterious factor known as "dark energy" believed to permeate the universe. Looking farther away into the universe (and, because of the distances involved, further into the past), they've seen evidence that gravity was at one point holding back the acceleration of the expansion of the universe. They have very little data, though, on the period of transition between these two phases, when the repulsion produced by dark energy surpassed the drag created by the pull of gravity. "Continued studies of supernovae will allow us to uncover the full history of the universal expansion," Blakeslee says. "The sharper images, wider viewing area, and keener sensitivity of ACS should allow astronomers to discover roughly ten times as many of these cosmic beacons as was possible with Hubble previous main imaging camera." Note to editors: Higher resolution photos of the two supernovae (pictured above) are available online. See hubblesite.org/news/2003/12/.